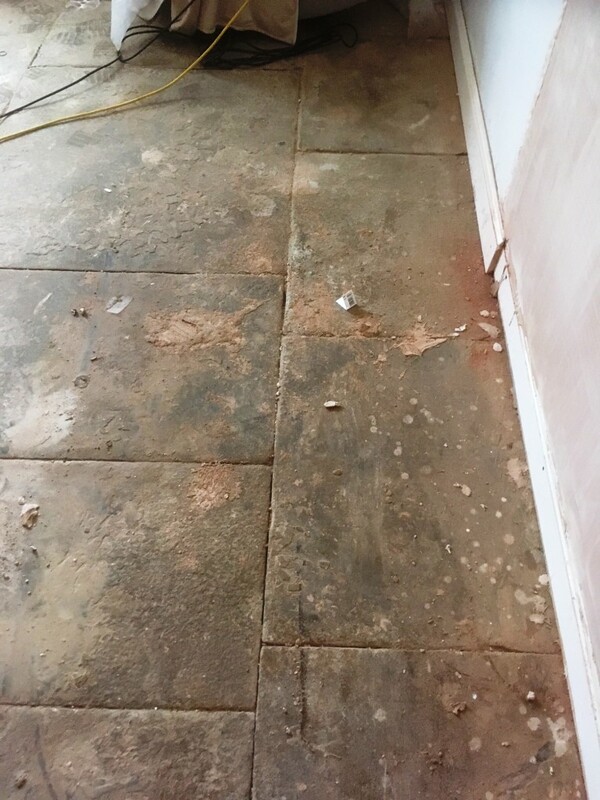 This client had contacted us for help renovating their Flagstone hallway floor as nothing they did was helping to keep them clean. 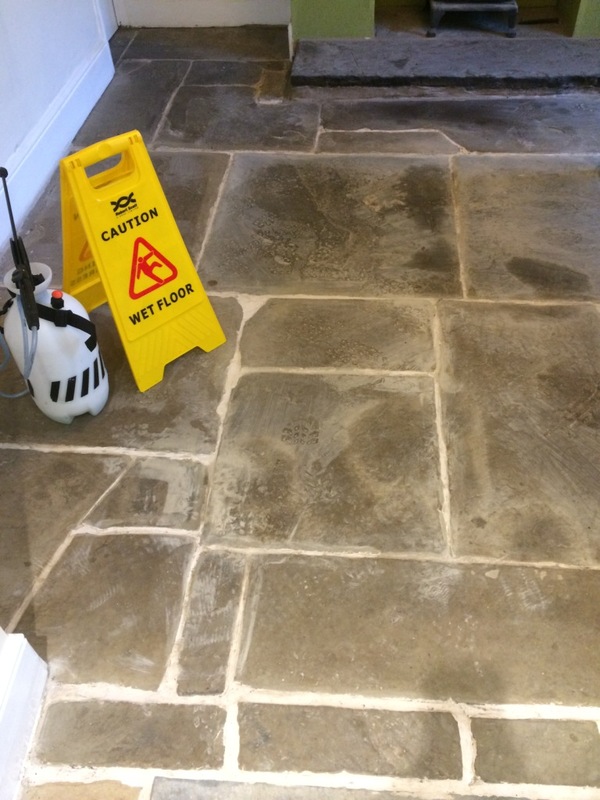 The problem with the tiles was due to the pores of the flagstone being ingrained with dirt and once this happens they are really difficult to clean effectively. 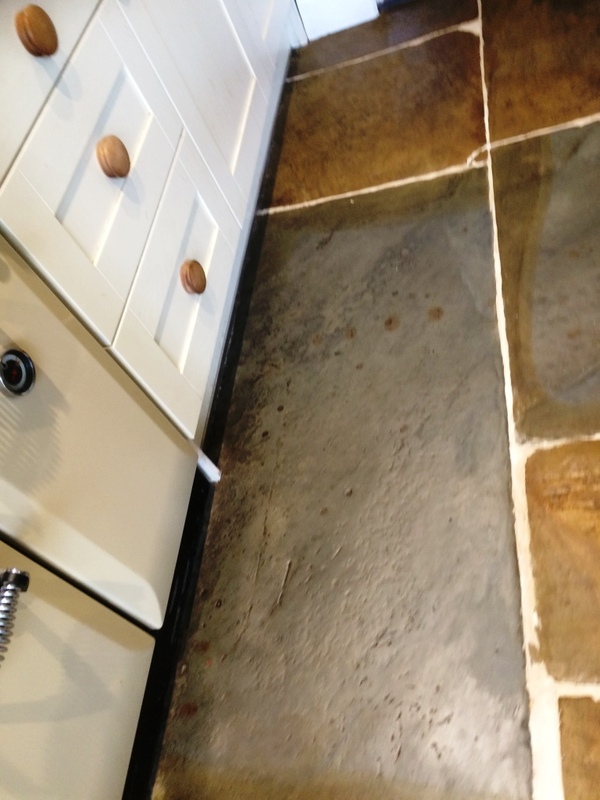 This is why we always recommend stones floors are sealed after cleaning. After a successful survey that included measuring background moisture levels and testing different products for stain removal I was able to work out the best process for cleaning the floor and a day to clean and seal the tiles was scheduled. I’d established during my earlier testing that I would need a very strong cleaning product to get the floor clean and deal with the stubborn staining that was present and with that in mind I applied Tile Doctor NanoTech HBU. HBU stands for Heavy Build-Up and is a problem solving tile cleaner and stain remover that adds nano-sized abrasive particles to the mix. This was left to dwell on the floor for a few hours and additionally was covered with a plastic sheet to prevent it from drying out. I then gave the floor a scrub using a black scrubbing pad fitted to a rotary floor machine and a strong dilution of Tile Doctor Pro-Clean for good measure. Once happy with the result the soiled cleaning solution was extracted using a wet vacuum and the floor given a thorough rinse with water to remove any trace of cleaning products. Again the wet vacuum was used to remove the fluids and extract as much moisture from the stone as possible. 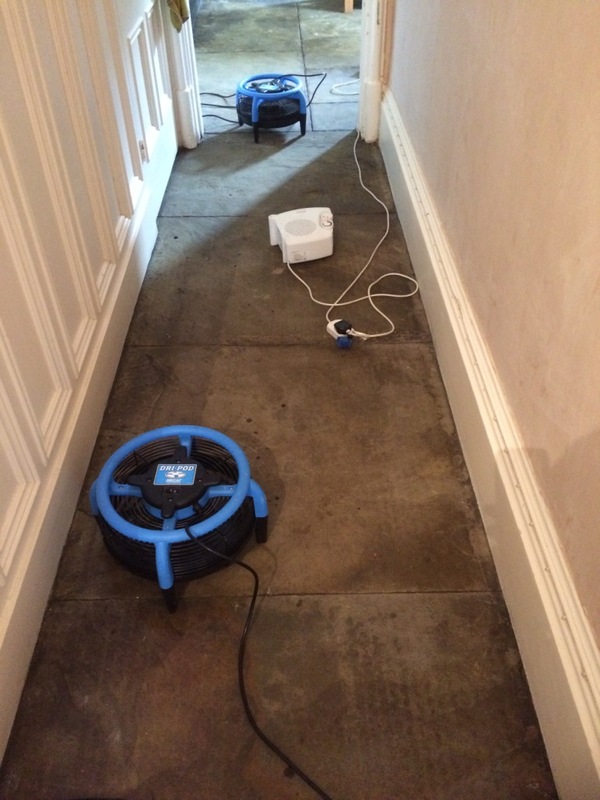 The floor was then left to dry out fully overnight assisted with a floor dryer to help accelerate the process. 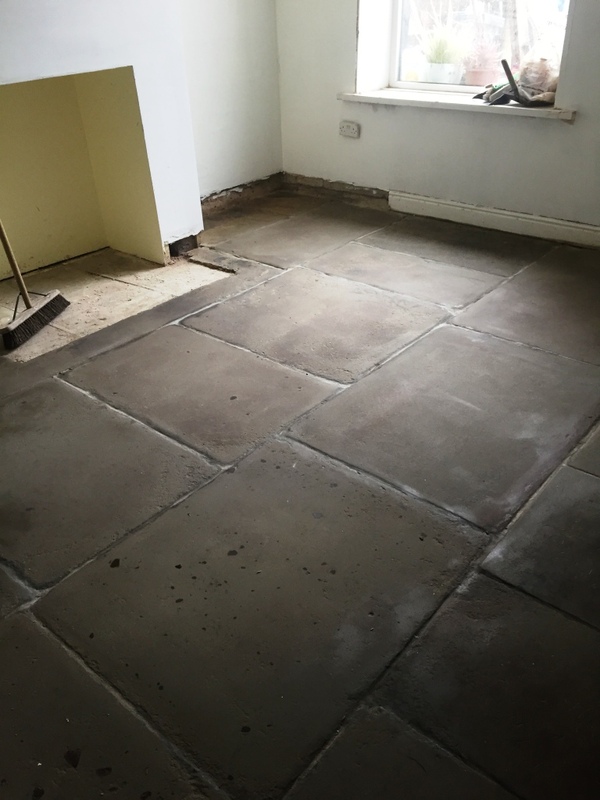 We came back the next day and tested the floor with a damp meter in a few different locations to make sure no dampness remained in the stone. 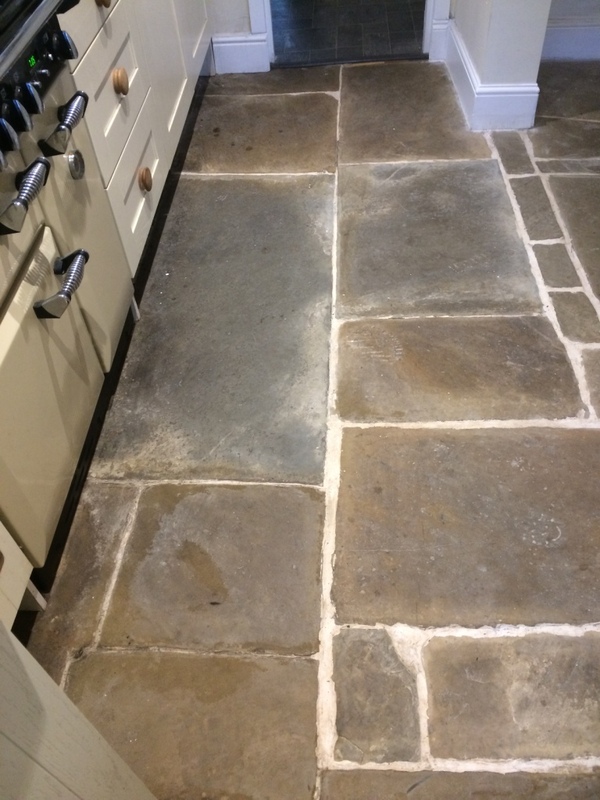 The air mover had done its job and the Flagstones were dry so we proceeded to seal the floor with a couple of coats of Tile Doctor Colour Grow which penetrates into the pores of the stone protecting it from within and enhancing the natural colours of the stone. It’s difficult to appreciate from the photographs but the customer was amazed at how much of a difference our process had made and at how much dirt we were able to remove. The flagstones were probably more then 100 years old and more aggressive machinery and cleaning products were the only things that would shift the old dirt. 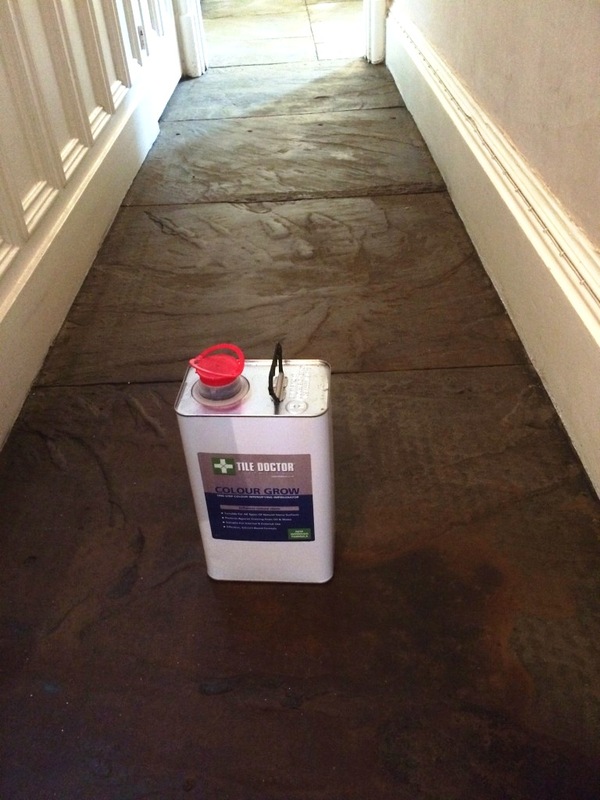 The fresh sealer will also ensure the floor is much easier to clean in future. The pictures below were taken in the Kitchen of a charming cottage situated in the village of Stacksteads near the town of Backup, North of Manchester in the district of Rossendale. 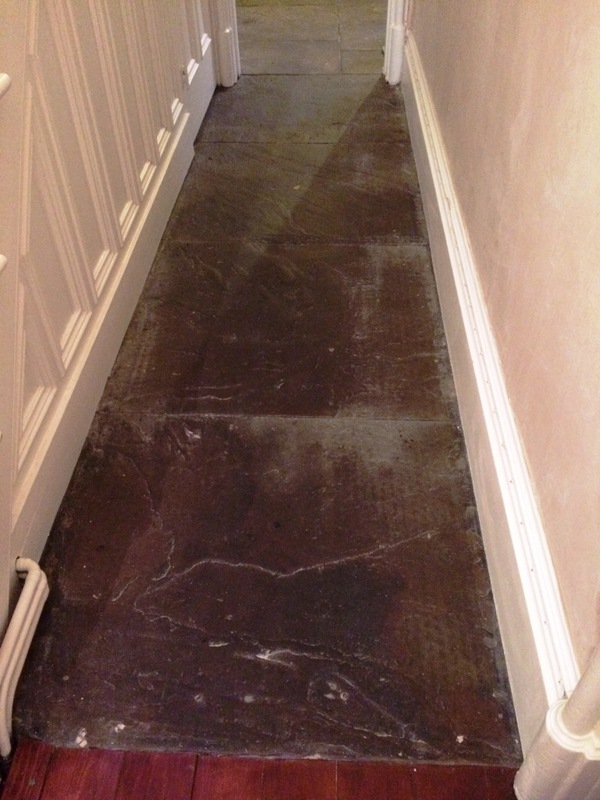 The flagstone floor was over 100 years old and the customer was unhappy with their appearance. They had tried to clean/mill and seal themselves a few years ago and had found the process hard work and very time consuming. This time round they decided to ask professional applicator at Tile Doctor for help. We had conducted a small patch test so we could show possible results to the customer. 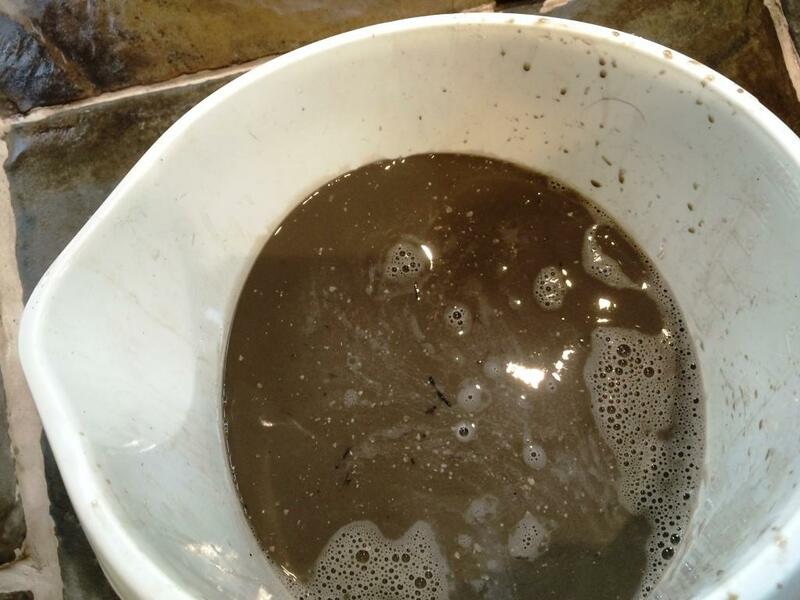 They had also advised us that they felt the stained areas of grout was beyond cleaning and would probably need replacing. However replacing the grout would have been quite an expensive option so instead of replacing we suggested deep cleaning the grout lines during the renovation process. The customers were happy with the results of the patch test so the job was booked in. 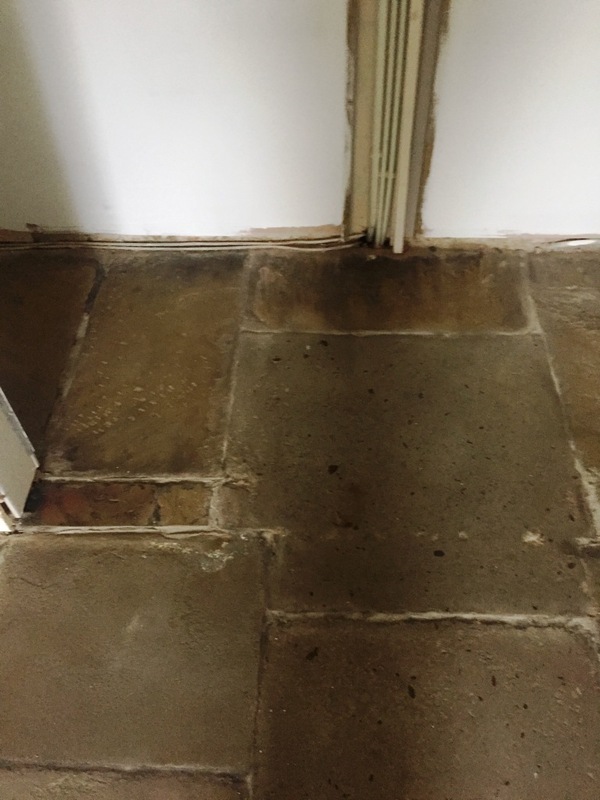 On our return visit we set about deep cleaning the flagstones using a strong dilution Tile Doctor Pro-Clean worked in using a Black Scrubbing pad fitter to a rotary cleaning machine. This action certainly gave the floor a good clean and removed the old sealer but some stains were proving stubborn to shift so we tried a stronger product called Remove and Go combined 50/50 with NanoTech HBU which add nano-sized abrasive particles to the mix. We left the resulting formula to soak into the stone for a while and then scrubbed it into the floor with a stiff brush paying particular attention to the grout lines. This did the trick and so we then removed the now soiled and dirty cleaning products with a wet vacuum and washed down the floor with clean water to remove any trace of product and neutralise the floor before sealing. We then left for the evening so the floor could dry out fully overnight. 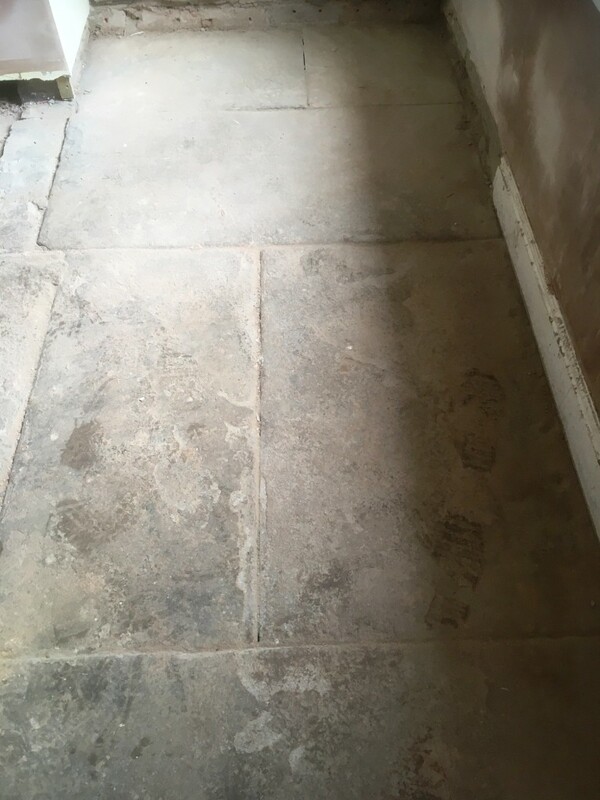 We came back the next day and tested the floor with a damp meter in a few different locations to make sure no dampness remained in the stone. 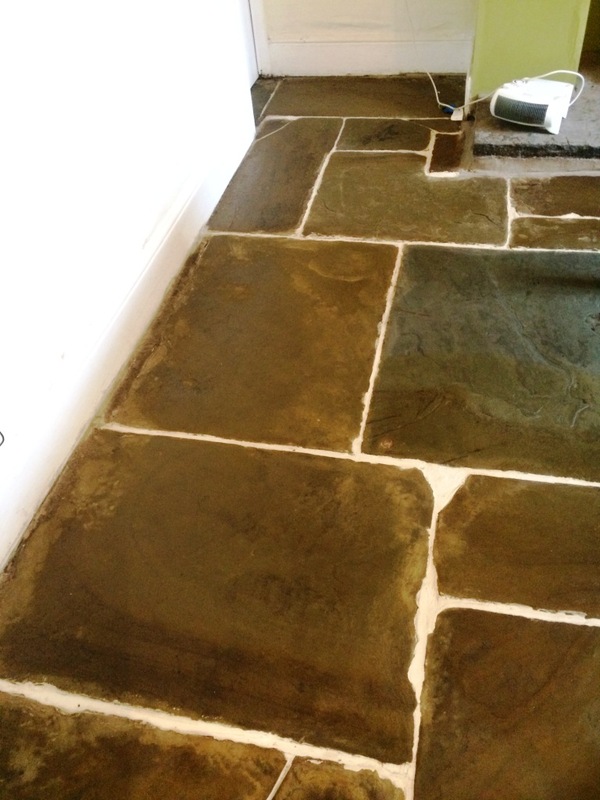 The Flagstone was dry so we proceeded to seal the floor with a couple of coats of Tile Doctor Colour Grow which penetrates into the pores of the stone protecting it from within and enhancing the natural colours of the stone. The beautiful colours of blue and dark sand were showing after sealing with Colour Grow which is the best sealer for stone floors. Certainly the customer was very happy with the results and left the following 5 star review! We could not praise Kamila enough. Our flagstone floor was in desperate need of some TLC. She was punctual, thorough and completely professional. Throughout the whole process she invited me to see the progress and to keep me informed of what she was doing. She also gave us good advice on how to clean and care for our stone floor. The end result is fabulous and we are absolutely delighted. We would definitely recommend Kamila to anyone.